We arrived a couple of hours before last orders on the Friday to find the Cromer Room busier than it had been for a while. Packs of skippers and crew stood around the bar making preparations for the next day's racing as we edged past. Ducking through the doorway of the far room revealed an unexpectedly free table in one corner, and a couple of spare stools were quickly borrowed. A beer mat jammed under one leg took care of the slight skew on the table (though not of the gentle list of the room itself), and we sat down to take in the end of the day, now disappearing below the horizon on the other side of the harbour. The nook we had found was tucked off to one side of the aft deck on LV87 - a huge red lightship which, after a working life spent stationed about 15 miles off the Norfolk coast, now stands watch over the assembled masts of Haven Ports Yacht Club in Levington, and serves as the clubhouse there. A few familiar faces gave nods of acknowledgement as we put our bags down, before returning to their own intent discussions of likely conditions on the start line. Our usual planning skills had seen to it that we had fixed the departure date for our summer cruise on one of the biggest regatta weekends on the East Coast. Tim answered the muffled ring of a mobile from his kit bag. The tinny crackle on the other end of the line seemed to make most of the running, with the conversation punctuated by the occasional interjection or question from the skipper. He stuffed the phone back into a side pocket. "Tom's delayed on a train from the airport, and Will's stuck somewhere on the M25. Not sure when they'll be here." "Time for a pint then." We had planned our journey to arrive in Holland mid-afternoon on Sunday, and had allowed a generous amount of time to do so as we wanted to cover as much of the distance as possible under sail. Our destination was Den Helder on the northernmost point of mainland Noord Holland, just below where Texel and the Frisian Islands sweep over the top of the IJsselmeer towards northern Germany and Denmark. From there, we would spend the week sailing south down the Dutch and Belgian coast, arriving in Nieuwpoort the following Friday to stage our journey home. 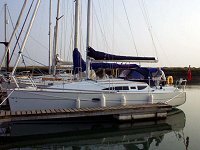 Our vessel was Nimrod, a Phillipe Briand-designed Jeanneau Sun Odyssey 32, generously lent to the four of us for the week by the owner. This loan was in fact the fulfilment of a bargain made several months previously between father and son. The previous summer, the owner Tony had told his son that the latter would not be permitted to take the boat out himself until he had qualified as an offshore yachtmaster. The determined Tim booked himself on a course immediately and returned to dad a few weeks later, certificate in hand. The other three crew members for the trip were all beneficiaries of this determination. Tim had been trying to order his father about on the boat for many years, though never before with the responsibility of actually being in charge. As we cast off the next morning without Tony on board to give the usual instructions, which in Tim's case nearly always fell on deaf ears, our skipper was a little more muted. After a brief response in the negative, Will assumed his previous position while Tom made his way to the foredeck to rig the spinnaker. "Lunch" was actually a small asymmetric kite that had been cut for Nimrod's predecessor, and was consequently a little small for the 32'. The reach up to North Shipwash was also a little shy, but with the forecast set to stay south-east, or even back slightly, we were keen to make any progress we could offwind. Twenty minutes later the spinnaker was back down through the hatch and Andrew, who had made his excuses shortly after our departure to get an early nap in the forepeak, was unceremoniously ejected to summon up the first meal of the day. The boat was in fact exceptionally well provisioned with airtight containers of "stovies" from a number of sources, all containing generous amounts of meat and potatoes. These - along with two large fruitcakes and plentiful jars of rice and pasta squirreled away in galley cupboards - would keep us going for most of the week. For the purposes of the first morning, some fresh bacon and eggs had been procured, which were duly fried and scrambled. Breakfast was served as we approached the North Shipwash buoy. We had made pretty good time despite only the briefest of appearances from the spinnaker, departing five minutes ahead of our scheduled 0600 and rounding the buoy at 0910. For a group of friends whose only previous sailing experience together had been a French and Belgian cruise the previous summer, and always under the guidance of more experienced sailors, being on the biggest crossing any of us had seen already felt very satisfying. The savour of brown sauce on plastic plates simply added to the experience. The skipper ventured below to make a log entry and check the navigation system was in order. He returned up the companionway with chart in hand while Tom helmed and Will glanced out from under a blue beanie hat. Our sense of achievement after rounding North Shipwash quickly diminished as Tim pointed out the change of course that would take us to our next waypoint, and the distance we would cover before we arrived. There were of course other marks on the route to the end of the Schulpengat Channel off Den Helder: oil rigs, shipping lanes and even the occasional cardinal. The skipper had concluded that the numerous rigs scattered around the North Sea would be fairly obvious even to less experienced crew members, however, while electronic navigation would ensure that our course across the lanes was correct. He therefore advised the helm to steer 65 degrees for the next mark - 121 nautical miles to the SG buoy - and with few complications ahead that might require his attention for at least another couple of hours, went back below. The rest of the morning was relatively uneventful, punctuated only by nominal watch rotations every two hours. Our journey was not entirely solitary, as the timing of the trip had enabled us to sail in company with another yacht making the trip to Den Helder. They had departed 20 minutes or so after us, and the bigger, quicker boat had been growing an increasingly distinguishable presence behind our transom since the North Shipwash. As the morning progressed, she ate up the vast stretch of blue behind us and came past about 100 yards off our port side at around 1115. The unmistakable tri-tone sound of a DSC radio call split the mid-morning lull. Andrew went below to answer, and immediately recognised the name flashing up on the display. "Anegada, this is Nimrod. Go ahead, over." A familiar voice came over the cockpit speaker: Tony had secured a position as delivery crew on the boat, which belonged to a friend of his, and was keen to establish that his own vessel was still in one piece. "Good morning sir! We were going to give you more of a head start, but the skipper was keen to set off. I've been nominated the ship's radio operator as no-one else knows how to operate this DSC kit. We're on four-hour rotations here - I'm on at the moment with John's son. Anyway I trust all's well on board, over." Andrew gave an update on the morning's developments, and also detailed the general surprise on board that Anegada had been able to see us at all with that huge spray hood standing proud on the coach-roof. He signed off confirming all on board were in good spirits, and that we would put a call in to them at our afternoon change of watch. They remained our travelling partner for another couple of hours, before we lost them over the horizon. We crossed into the deep water channel at 1520 that afternoon, not that you would have noticed. The invisible line in the water delineating the channel running north from the Noord Hinder Precautionary Area brought no change to sailing conditions. Tom and Andrew were on watch, though Tim and Will were also on deck, the skipper in particular wanting to make sure that we crossed the lanes safely. Regulations on crossing the Deep Water Route are less strict than for the formal Traffic Separation Scheme running between the Dover Strait and the Precautionary Area, which requires yachts to steer a course perpendicular to the lanes. The wind had dropped slightly, though the direction had remained constant and our progress was a steady 5-6 knots. 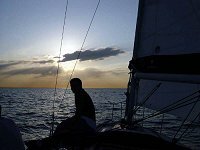 The skipper was keen to reach the other side of the lanes before dusk, though with plenty of daylight remaining the decision was made to continue under sail. With the wind easing Tim jumped down into the cockpit to ease the kicker and try and fill the mainsail. A dramatic crack came from the underside of the boom, followed by the tinkle of fractured plastic dropping onto the coach roof. What soon became apparent was that some overzealous winching earlier in the day had caused one of the pulley wheels in the kicker to crack and become wedged in the block. Releasing the tension had allowed the wheel to break completely. The initial noise caused some concern among the crew, though in fact the cockpit locker contained a number of replacements for just such eventualities. Tim swapped the part out with no further drama and we continued on our way. The skipper communicated this minor breakage to Anegada at our next radio update, and the conversation ended shortly afterwards with a rather disparaging comment about "dinghy sailors", nearly indistinguishable through the crackle. Dinner on board that evening was chilli con carne, heated up by Andrew. It had taken us around three hours to cross the Deep Water Route, by which stage we had more than half covered the distance to the SG buoy. The weather and wind had remained fair, and the log ticked through eighty nautical miles as food was prepared. Conversation over dinner centred on how to approach the night stretch. Conditions during the day had not required lifejackets except for rigging work, though these were to be fetched and worn after the meal. The informal watch system that we had operated through the day would begin in earnest at 2000 with Tim and Will taking the first leg. Tom's bobble hat - banished to the forepeak for most of the day - reappeared for the final section of the briefing as plates were gathered up and taken below. Tom and Andrew took the opportunity to get some rest before their shift started, and as the sky faded to lilac and navigation lights were switched on, a spot on the horizon began to tap out nine short flashes: a pattern that we recognized as Brown Ridge cardinal buoy. By the next change of watch at 2200 the sky was dark, and the wind had backed just enough to start making things uncomfortable. We had remained on course up to this point, though it was becoming more difficult to hold our line with the wind moving easterly. The discussion held in the cockpit at the handover really only needed to be brief though: we had covered more than 90 miles under sail, we had a steady 15 knots of true breeze, and with lamp-ringed oil platforms now lighting up the inky distance it would be a shame to lose what looked set to be one of the most captivating parts of our crossing to the throaty rasp of a Yanmar. We had enough wind to tack if necessary, and would do so if our instruments told us we had deviated too far from the right course. Tom and Andrew's watch saw us continue on starboard until the backing wind had pushed us three miles north of our intended course. The first tack of the day was made with less than an hour of it remaining, and we held port until we had sailed mile or so under our proper line, before going about again. Our tacking back had been forced to some extent by a ferry on our course. The ship had appeared from its starboard light to be travelling a parallel course, but after a while was clearly growing larger and moving closer. Changing tack proved timely, as our new course showed we had come a little over half a mile away from the parade of bright deck lights as the big ship's engines gurgled past. Before too long Will and Tim emerged from fore and aft cabins and began to brew the customary round of Earl Grey tea that had become a regular feature of watch handover. Tom went below to give a brief synopsis of the previous couple of hours, while Andrew took the helm and looked round the horizon to check for any lights that had not been accounted for. A lighter patch on the water ahead made him look again, though with the saloon light just switched on this could equally have been a trick of the light or a touch of night blindness. A glance to port and starboard gave the all clear there, when out of the darkness in front appeared the full glare of a ship's lights. "Tim, you might want to come and look at this." The vessel was no more than 200m in length, and between the haloed deck lamps it became possible to make out an approximate hull shape against the night-time sea and sky. The vessel was now completely visible from behind the genoa. In the few seconds it took the skipper to appear from below with unzipped foul weather jacket, front and rear masthead lights on the ship had been identified, as well as a green lamp mid way between the two that by this time was about 20 degrees off to starboard, and moving quickly away. We bore away to make sure we were well clear, though we still passed on the shy side of 200 metres astern of the vessel. Tom and Will had followed quickly up the companionway in time to stand on the cockpit seat and yell at the great iron hull as it passed us to starboard. As if in answer, the cockpit speaker crackled to life and an unrecognised voice gave the briefest of responses. The cockpit fell silent, and Tom stepped back down from the seat onto the deck. What the voice meant, whether it had addressed us directly, and what the ship was doing in the middle of the North Sea at night and without lights we still don't know. As the hull rounded our stern and pulled away in silence, a dazed crew completed the handover, narrating the previous couple of hours, and the progress we had made. Tom and Andrew went below for some welcome rest while the first watch completed preparations to take on the next shift. The sea at night bears little resemblance to its daytime form, with the sky above often barely distinguishable from its surface. Star formations sitting on the horizon and overhead are partially mirrored by the configurations of illuminated ships, rigs and markers on the surface, which perform a slowly choreographed movement as the hours pass. With no radar on board, sailing the boat becomes less about tweaking settings for speed, and more about reading hieroglyphic lights to establish the intentions of other vessels on the water. In rough conditions, the boat pitches on invisible rollers, the bow slapping the surface periodically and sending up fine clouds of brightly lit spray in front of the bow light. The near silent calm of our night crossing, however, gave us plenty of opportunity to study the horizon, and read patterns of movement among our travelling partners. Tacking in these conditions adds a new dimension, as each tack brings a period of reorientation as ships and fishing boats seen previously are re-identified and the course reappraised. As far from land as we were, offshore rigs were the only thing giving us an absolute fix on our position, in addition to the occasional dimly twinkling cardinal between other brightly lit, though mostly mobile configurations of lights. We had advanced on two sets of exploratory well heads now several miles after Brown Ridge. The wind gave us no help during the following two hours, which felt like a long spell simply spent tacking up and down the stretch between the two rigs. A touch of helpful tide enabled us to make some progress though, turning the less than four knots through the water we were able to squeeze out of our favoured starboard tack into four and a half. We were willing to take any help from the conditions we could get. "Station calling on channel 16. Say again, over." A panicked voice with a Chinese accent repeated its previous entreaty. "Vessel approaching in front. We are on collision course. You must alter your course to starboard." "Sir, we are tracking you on radar. We are currently three and a half miles away and monitoring your position. We will of course alter our bearing should it become necessary, over." "ALTER YOUR COURSE TO STARBOARD! WE ARE HEADING IN COLLISION!" The conversation continued in a similar frantic vein for another five minutes or so, with reluctant responses from the English skipper being hotly followed by further imprecations from his opposite number. The Chinese skipper eventually became so heated that with a final abrupt "OTHER STATION I WILL ALTER MY COURSE TO PORT", he signed off. We had seen no sign of either ship, though by this time in the night, with the wind having fallen to about 11 knots and moved until it was coming almost direct from our intended heading, the conversation provided some light relief. If anything the episode gave us some sustenance beyond what we were getting from the Earl Grey and now substantially reduced fruitcake, as it gave us the knowledge that we weren't the only souls making our way through the dark. Radio updates with Anegada also came every two hours or so, as they continued to point out areas of interest ahead that we subsequently found marked on our chart. Our travelling companions had been under motor for several hours as we continued to tack against the headwind. Having come this far, the assumption remained that we would sail out the night, as our course continued to take us north and then south of our line, in one instance just below a lamp-ringed exploratory platform rising fifty metres out of the water. The general radio chatter, whether from within the boundaries of our own immediate surroundings or reflected by the ether from some more distant water provided the sense of company through the dark. A US Navy ship hailed one of the trawling boats that we had seen periodically throughout the voyage, announcing his intention to pass and reminding us that the port for which we were bound contained a military installation, no doubt acting host to some foreign forces in North Sea waters. At around 0500 we saw a dawn grey shape coming through the lightening mist behind, and wondered if it had been the same vessel. As it cruised silently past, the one or two crewmen looking out from behind the panes of the bridge gave us the customary greeting. We had not yet replaced the ensign after wrapping it up for the hours of darkness, and so could not give a more appropriate salute to the frigate in return. Tom had retrieved a klaxon nestling beneath the spare ropes in the cockpit locker, which he employed as a morning reveille for Will through the slightly open door of the aft cabin. The latter was taking longer than the tacitly accepted five minute grace period to emerge, while the three remaining crew stood on deck still tightly wrapped in foul weather gear, hands in fleece-lined pockets against the morning chill. We welcomed the start of a new day in the knowledge that we were closing quickly on our destination. The wind had veered round again quite dramatically, while the light rain drifting down earlier in the morning had stopped. A touch of enthusiasm from the skipper led to a brief attempt to hold the spinnaker shortly before 0600. Unknown to us at the time, the wind shift had signalled a weather change that saw the breeze getting lighter and lighter over the next hour and a half. We sailed until a glassiness fell on the surface of the water, and the wind indicator overhead moved only in response to the rocking motion of the mast tip. It was time to get the motor on. With four hours left until our eventual arrival at Den Helder, we took the opportunity to get some more hot food, with bacon and eggs again the dish of choice. The regular rotation of watch had meant that we were all well rested from the night, and saw out the morning chatting in the cockpit. We had switched the engine on shortly before a cluster of cardinals marking out a wreck sitting beneath the surface, which we gave plenty of room. The log read 148 nautical miles as we passed SG buoy, and the ninety minutes between the mark and tying up in Den Helder were spent tidying up and preparing to receive the owner back on board. A healthy two and a half knots of flood tide pushing us up the Schulpengat gave a good kick to our final run in. Tony, already showered, dressed and well rested from his own crossing, took our lines as we pulled into the marina berth, and was quickly assured that no mishaps had befallen us. We sat in the cockpit in the early afternoon greyness, while slightly cool cans of beer were fetched from below and some Elgar played quietly on the stereo. We spoke about our respective trips and plans for the rest of the day, before getting cleaned up and taking on water. Five berths down, the crew of Anegada did the same, and prepared to receive us on board for drinks in advance of the evening's yacht club dinner. The meal that evening was much appreciated, and the short fluitjes of local brew served in the club were present in sufficient quantity to ensure a celebratory end to the first leg. The next day we were bound for Ijmuiden, while Anegada set a course for Brunsbuttel. We had taken a visitor on board - a Dutch colleague of Tom's named Bonnie, who had spent the previous two days on Texel. The wind had stayed slightly north of West and strengthened, which meant a relaxingly broad reach due south down the near vertical Dutch coast. We maintained radio contact with our erstwhile travelling partners until out of range, and then basked in the afternoon sun while regaling Bonnie with moderately embellished tales of our trip over. We were happy to have arrived.